Morels are as elusive as spring or love. Who really knows when either will appear? You must be ready! This year, the odds seemed stacked against us. What's almost as good as finding morels yourself is knowing someone who can hunt. These gorgeous morels come from an intrepid morel hound who stalks all the dead elm, and has one of the sharpest eyes around. 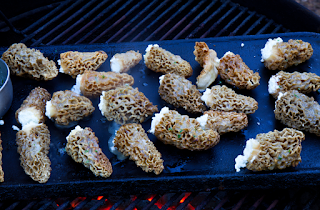 The morels in the photo are stuffed with garlic-scented chevre and grilled. Simply cooked, morels are the essence of the damp spring forest, reminiscent of wet leaves and moss and woodsmoke. Just be sure to cook them thoroughly before you serve them, they should be very soft and slightly browned. - Then you're ready -- saute in butter or toss with olive oil and then grill, or toss with oil and roast in the oven. You'll know they're cooked when they're very tender and dark brown. Serve just as is, or heap on bruschetta, or swirl into scrambled eggs, or toss with pasta, or serve over rice. They're fabulous on pizza or in a sandwich. But be quick, they'll soon be gone.